Gone but not forgotten, former Korean President Roh Moo-hyun’s self-defenestration has already been reduced to trivia in America, withmembers of MSNBC’s online beloved community invited to sort out his death details, multiple choice style! How much do you remember about the week in news? Take msnbc.com’s weekly quiz and find out what you can recall. 6. 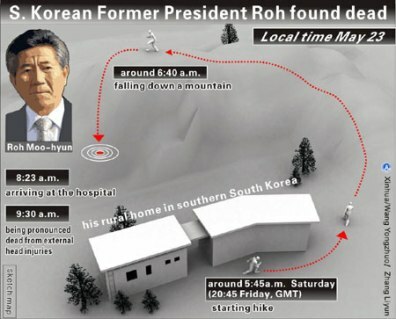 In South Korea, meanwhile, the nation was shocked when a former president, Roh Moo-hyun, disgraced in a corruption scandal, committed suicide. How did he end his life?